The Crown Standard set is one of the most popular sets for home and also commercial use. You will see this set used on bar tables across the country. 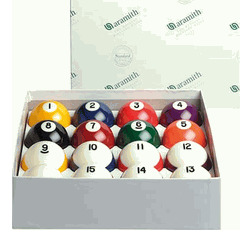 This set has a standard (non-magnetic) cue ball. These Crown Standard balls measure the standard 2-1/4" in diameter and are regulation weight.